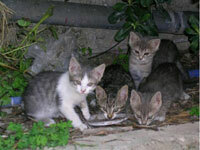 "Thankyou for visiting our website, I hope it gives you a good idea of what we do to help the street cats on Crete. The website has been wholly designed and created by volunteers; we could have gone for a 'all singing and dancing site with whistles and bells' but we prefer to spend our valuable time caring for animals, therefore we have kept it as simple as possible but at the same time as informative as possible. Please do contact us with any questions or for more information"
Cretan Cat-a-List was founded in 2004 by the current president, Jayne Butler and a group of dedicated animal lovers who were all very concerned about the welfare of animals in their area, as well as the lack of support available to any animals in peril. It has been an established registered charity since 2006 and is staffed entirely by volunteers. Over the years it has cared for thousands of cats, and as it never turns an animal away, has also looked after donkeys, goats, ducks and all manner of needy creatures. When you are in a situation of being overwhelmed by the desperate need of so many animals, it is vital to work with other groups to provide the best possible solution to each individual crisis. Cretan Cat-a-list has become part of a network of local and national groups all working for one cause – to improve the lives of animals worldwide. 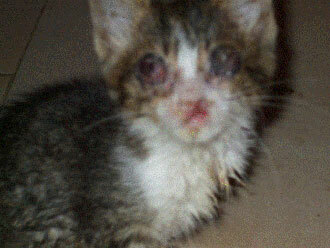 Magic - As found, blind with terrible infections. 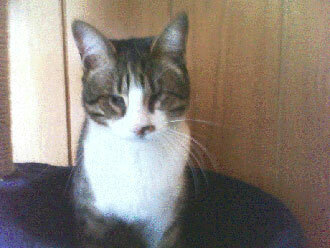 Magic - today in his new home. Cat-a-list would not exist without its dedicated volunteers, over the years many people have helped to make Cretan Cat-a-list the professional and respected Charity that it is today. A big thank you to everyone for making this happen, here are just a few. 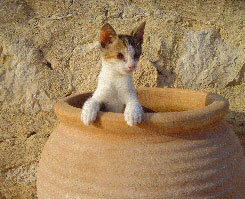 . .
Jayne Butler—President of Cretan Cat-a-list. Founder of Cretan Cat-a-list, Jayne moved to Crete in 2001 from Ireland, along with her two rescued greyhounds and two cats. Horrified by the lack of care and animal welfare facilities available on the Island, she embarked on the creation of the Charity. Jayne works full time for the Charity on a voluntary basis and co-ordinates the day to day operations as well as being the main fundraiser. She is a believer in sharing and networking and works with dozens of other groups throughout the world to raise awareness of animal suffering. Maggie Waldon – Vice President & Catsbody. Maggie lived and worked in Crete from 2003 – 2008, during which she became involved in animal welfare. 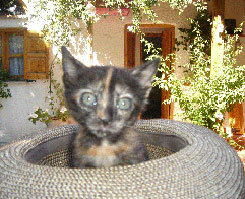 Cretan Cat-a-list helped her with the assortment of animals she adopted during her time on the Island. 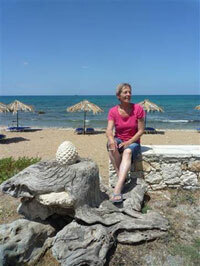 Now based back in the UK, Maggie lives and works in Bristol along with her 5 Greek cats and 3 Greek dogs! Seen here doing a radio interview for Cat-a-list with Nigel Dando for BBC Radio Bristol. Emily Goodwin – Kitten Foster Mum. Emily has given numerous Cretan cats a home over the years; now with 7 'permanent' adult cats (some of these having come directly from Cat-a-list as kittens who never left!). Emily now fosters kittens during the Spring-Summer months and is gradually taking over the technical side of things for the charity. Silke Becker – Germany Rehoming Team. Silke and her team help keep Catalist running. They find foster homes and permanent homes in Germany which the cats/kittens move to when they are old enough to travel. They also help with fundraising. Patrick de Landre-Grogan – Web Developer. "The Internet People LLP" in the UK. Patrick has contributed his time to the development and maintenance of this website for free as his contribution to the charity. You can find out much more about Patrick at his website www.the-internet-people.co.uk.